India legend Sachin Tendulkar scored his landmark 50th Test match hundred as they battled to save the first Test against South Africa in Centurion. The 37-year-old great reached the milestone as India fought back on day four, reaching stumps on 107 not out. "It's just another number but it's nice," said Tendulkar. "Every innings, I want to go out and score runs." Tendulkar, who also passed 14,500 Test runs during the innings, brought up his century with a single off Dale Steyn. Australia captain Ricky Ponting has the next highest number of hundreds in Tests with 39. Tendulkar added: "I'm very happy that it came at this moment. Saturday was my father's birthday and so I dedicate this hundred to him. That's the first thing I thought of, that I was doing it for him. And also to say thank you for all the fabulous support I have had over the years. "I'm just really enjoying my batting at the moment and when you are striking the ball really well and moving well, you need to cash in as much as possible. It's extremely important to have that hunger, that's what keeps you going." Tendulkar's century, which included 12 fours and a six, came in a gritty fourth-day fightback from India as they tried to avoid defeat against South Africa. Having been bowled out for 136 on the first day - with Tendulkar top-scoring on 36 - and suffered in the field as South Africa racked up 620-4 declared, the Indians reached 454-8 at the close on day four, trailing the hosts by 30 runs. Despite needing a miracle to avoid going 1-0 down in the series, Tendulkar believes India can leave Centurion with their heads held high after a stirring fightback. "You need to think positively," he added. "The batsmen have produced a very good response and it was extremely important for us to come back strong, to send a strong message and we've done that. We need to keep that up, do that for the remainder of the series." India coach Gary Kirsten, who has seen Tendulkar at close quarters for the past three years and came up against the right-hander during his Test career for South Africa, paid tribute to the man affectionately known as the 'Little Master'. "For me, Sachin is the professor of batting," said Kirsten, who scored 7,289 Test runs. "He's the model professional cricketer, he works harder than anyone else at his game and it's a privilege to work with him. "It's little wonder he's been so successful because he treats every single cricketing day with humility and respect. He doesn't take one ball for granted in practice and you never see him have a loose net." Kirsten believes Tendulkar, who scored his first Test ton as a 17-year-old at Old Trafford against England in 1990, is enjoying his cricket more than ever before. "He's a fantastic team man and he's so desperate to do well for India," added Kirsten. "He really gets emotional and passionate about the team doing well. "This is an incredible individual milestone for Sachin, but he wants to make contributions to the team. He wants to make sure that the team is doing well while he's getting these milestones. "He is enjoying his cricket as much now as he ever has done. The team doing well over the past couple of years has been good for him and in the last year he has been unbelievable. I've seen a real determination in the last year." 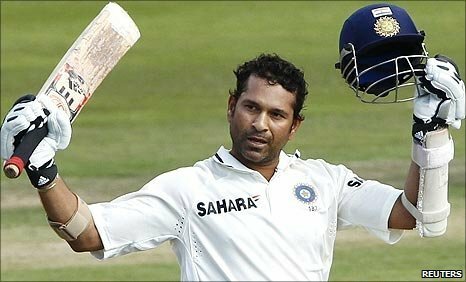 Tendulkar is the leading run-scorer in Test cricket in 2010 with 1,539 at an average of 85.50, including seven centuries and five fifties. The world of cricket was quick to pay tribute to Tendulkar's latest stellar feat, with Indian all-rounder Yuvraj Singh proclaiming it the "greatest achievement by a batsman ever" on Twitter. Former India batsman Sanjay Manjrekar also tweeted: "He has got it finally! And judging from his reaction... meant a lot to him... the 50th Test ton... this is one record that is there to stay."